Since the opening of the Hubneo VR Lab in NYC, we have learned that kids absolutely love VR. The incredible excitement that we’ve seen in the kids who come to the Lab gave us the idea to create the Hubneo VR Summer Camp, an opportunity for kids to take a much deeper dive into the world of Virtual Reality. Our camp is an amazingly fun and educational way for the kids to obtain a comprehensive understanding of this exciting new technology. We want the kids to feel as if they are a part of the Hubneo team, especially when they offer feedback about games and hardware performance. We also want to ensure that, when the camp is over, all of the kids will come away with a strong set of practical knowledge and problem-solving skills that they can use outside of the Lab. This could be as specific as setting up and optimizing their own VR system, or as broad as troubleshooting any number of technical issues involving VR, PCs, software, or gaming. Of course, the actual game time is a huge part of the camp as well, and the kids have the opportunity to try many more games than they would in a typical session at the Lab, including new games that we are beta-testing. Our VR simulation systems are also interconnected, which means that the kids can play and learn together, using teamwork to solve problems and overcome obstacles in game. If there is a specific game or game genre that a camper wants to practice to improve his/her performance, such as racing or flight, we provide personalized training from the experts on our team. This is a complete list of VR games and VR experiences available at the Lab. We can also accommodate for specific requests from kids and parents. We want to make sure that if there is anything at all that the kids are curious about regarding VR, that they have a chance to explore it during the camp. In addition to the VR sessions indoors, we utilize a large private outdoor space where we set up a gazebo, table, and benches. This is a perfect place for lunch (provided), as well as a place to take breaks and get some fresh air throughout the day. 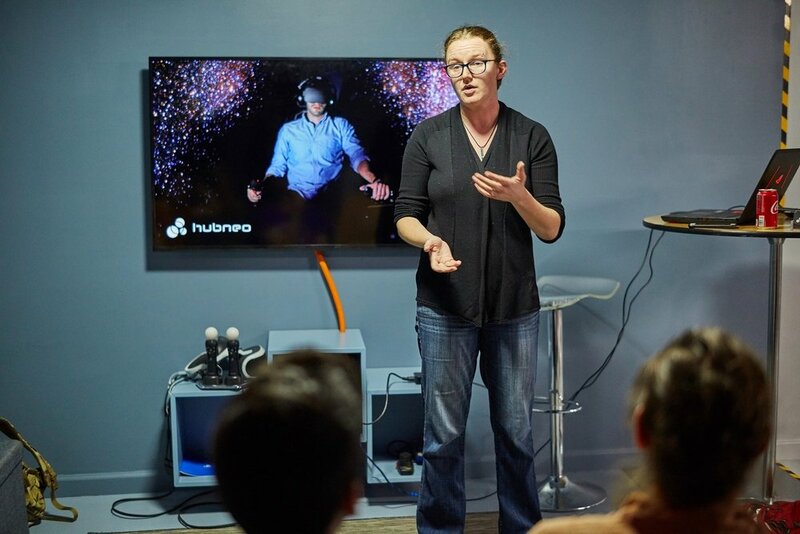 We’re really looking forward to this new adventure, and hope that the kids will be just as excited as we are when they hear about the chance to come spend a week at Hubneo! To sign up for the camp click here. If you have questions please feel free to contact us at contact@hubneo.com.